Looking to clear up pfsense config file. Disable DNS lookups on secondary wan when primary WAN is online. PFSense box or pro-sumer gateway??? pfBlockerNG. DNS blocks root domain (TLD not selected)? A few newbie questions. Be gentle. Can someone help me how to setup KVM headless pfsence setup? can I send hourly reports with the mailreports package? Traffic Shaping - Use "By Interface" or "Limiters" ? 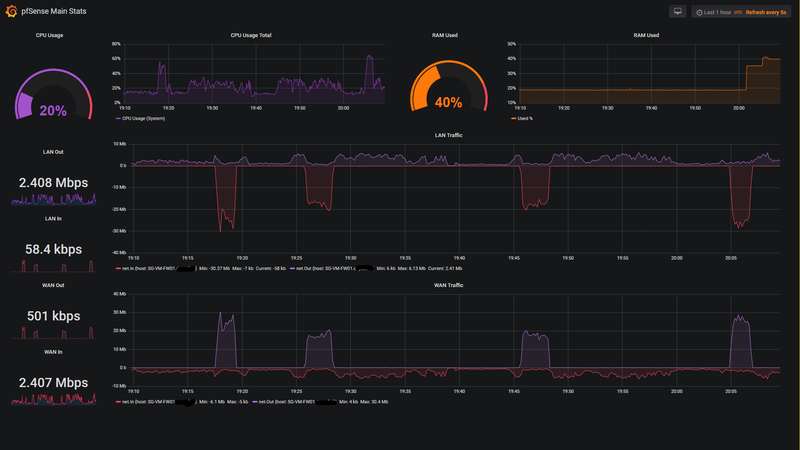 My first venture into Grafana. Just a simple pfsense monitor for now bur quite proud of it. Anyone using 2.5 in production at home? Bell Fibe, PPPOE, can ping, can't browse. Policy routing based on DNS names? 2.5.0 .img.gz unpack and change file extension to .ISO does not perform as boot install .ISO. pfSense clients can't communicate with the main network, but pfsense can? Can't enable OpenVPN interface for bridging. Setup rules for a VPN WITHOUT using OpenVPN built in. Will PFSense outperform UniFi USG? How to use the DHCPv6 Server "Dynamic DNS" options? Failover, across wireless link, between asymmetrical pfSenses - design ideas? Enabling the OpenVPN client on my Buffalo router causes a significant drop in internet performance. Would I benefit from building my own router and running pfSense on it? Help with NAT/Redirect IP/Port Forward? How to allow LAN IP address to access pfsense?